↑ "Happy Birthday MS Dhoni: 'Captain Cool turns 35 on Thursday". द इंडियन एक्सप्रेस. अभिगमन तिथि २७ जनवरी २०१७. ↑ "Why M.S. Dhoni's 300 is a rare feat". ↑ "'Players and Officials". 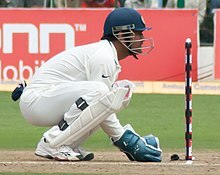 http://content-usa.cricinfo.com/india/content/player/28081.html. ↑ "Scorecard: Duleep Trophy Final 2003/2004 Season". Cricinfo. अभिगमन तिथि 12 मई 2007. ↑ "Highest scores by wicketkeepers". रीडिफ. 6 अप्रैल 2005. अभिगमन तिथि २६ जनवरी २०१७. ↑ "MS Dhoni dropped from T20I series against West Indies, Australia". ↑ "Dhoni not part of T20I squad to face West Indies and Australia". ↑ "अभी भी टी20 क्रिकेट के 'किंग' हैं महेंद्र सिंह धोनी, ये है वजह". ↑ "क्रिकेट / धोनी वनडे टीम का अहम हिस्सा, वे ही चाहते थे कि पंत को टी-20 में मौका मिले : कोहली".